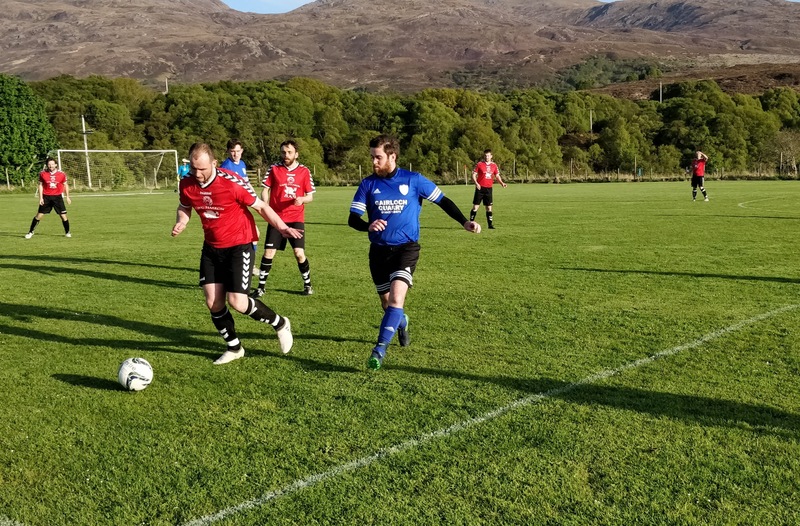 The top four teams in the Skye and Lochalsh League will meet this weekend with two places in the Ross Cup Final up for grabs. Last season’s league champions Kyleakin will travel to Broadford to play Sleat and Strath, while Mallaig host Portree Juniors in the early kick-off. Mallaig (in blue) are looking for their third victory in a row against Portree Juniors (grey), who are four points off top spot in the league. 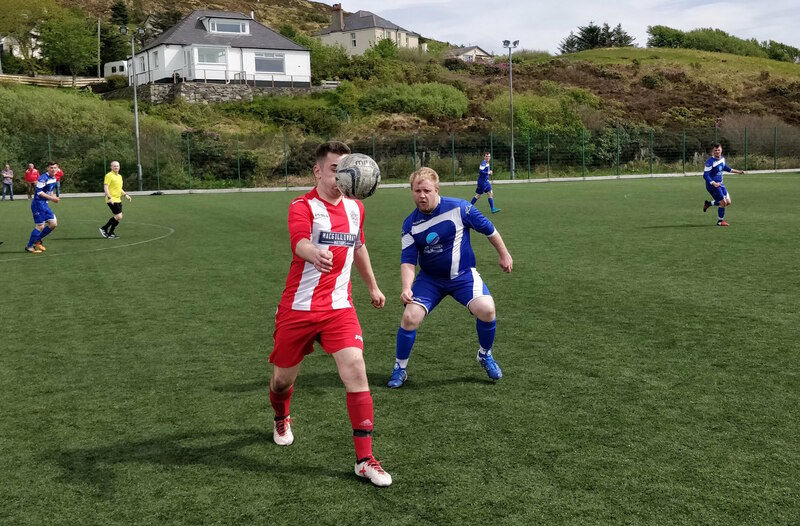 Mallaig: In what is their debut season in the Skye and Lochalsh Football Association, Mallaig have made a marked impression in the league – where they currently sit fourth – and in the associated cup competitions – in which they are seeking to reach their second final today. With six wins from their eight league fixtures so far, the Lochaber side are keeping pace with the top teams in the league. Having beaten Juniors twice already this season – 2-5 and 0-6 – Jamie MacGregor will have faith that his team can make it a hat-trick of success and book their place in the final. Mallaig’s Andy Cunningham (in blue) has been one of the top players in the league this season. In their last semi-final outing, Mallaig defeated Sleat and Strath 10-8 in an incredible game to secure their place in the GF MacRae Cup Final. 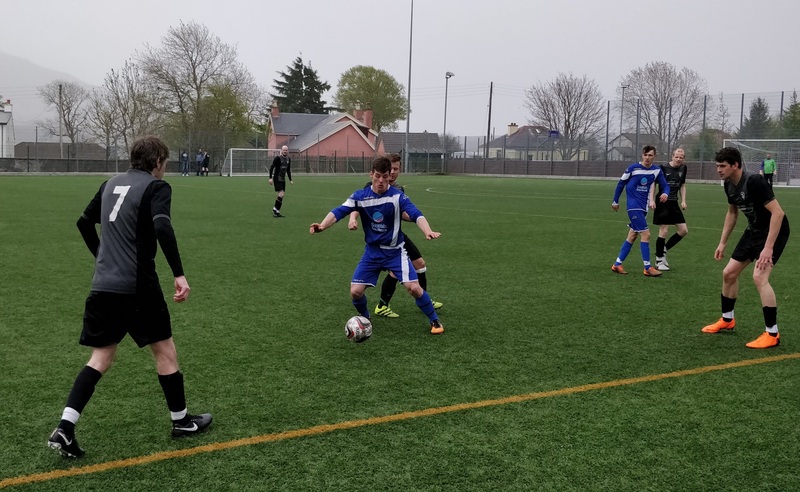 The blues, however, will be keen to avoid a repeat of their performance in the final which saw Kyleakin run out 4-1 winners in a disappointing and underwhelming showing by Mallaig. Jamie MacGregor, Mallaig: “Another tough game for us, but it’s the type of games we wanted to be involved in at the start of the season. We now have a great opportunity to make a second cup final this season. Portree Juniors: With four wins from their last five matches in all competitions, and 37 goals scored in the process, Juniors have really hit their stride and will approach their third meeting with Mallaig with great confidence. Now just four points point off leaders Sleat and Strath with one game in hand, Phil McCaherty will hope his team can transmit their impressive league form into today’s cup match against the only side who have beaten them domestically this season. Danny Steele (in white) is a key player for Portree Juniors and sets the tone for the team. While Juniors’ recent free-scoring display will have given Mallaig some food for thought in their preparations for the match, the Portree side must avoid the lapses in concentration which cost them in their heavy defeats at home against Mallaig in the league and Loch Ness in the Highland Amateur Cup. There was nothing to separate Kyleakin (red) and Sleat and Strath ( green and black) l the last time they met in the league which finished 0-0. 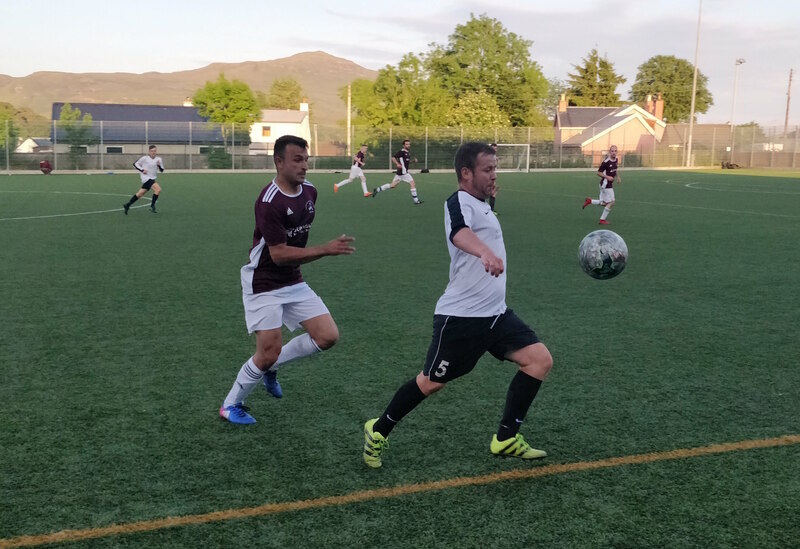 Sleat and Strath: It’s been a fantastic season so far for the Broadford-based side who are the current league leaders, joint top scorers, and have the meanest defence to boot. With an average of 5.2 goals a game in the league, Sleat and Strath have developed a ruthlessness in front of goal and appeared to have a strong belief when they take to the pitch that they can beat any team whether it be at home or away. Their most recent win in which they turned a 3-0 lead at half-time into an emphatic 12-0 victory in last week’s quarter-final tie against much-improved Glenelg is evidence they have the weapons to transform a tight match into a comfortable victory. Sleat and Strath’s Lachlan Macinnes (red and white) has given his all for his side this season in what has been a great campaign so far for the south Skye team. Having put in impressive defensive displays against both Kyleakin and Portree Juniors in the league, DL MacKinnon’s team have proven they can stand firm when required against tough opponents. That said, he will still be mindful of his side’s loss in their last semi-final encounter against Mallaig – in what has been their only defeat so far this season – and will be keen to avoid missing out on a second final. Kyleakin: With Sleat and Strath having burst out of the blocks in the league and new boys Mallaig also making their mark, it is perhaps easy to overlook the fact that Kyleakin is not only very much in contention for the league title but have already won a piece of silverware this season with a convincing victory over Mallaig in the GF MacRae Cup. With 22 goals in their last three matches, which included their 10-2 quarter-final win over Kyle, the reigning league champions know how to win games, and ultimately trophies. As well as being well-deserved, their 4-1 victory in the GF MacRae Cup Final against Mallaig was a superb example of game-management against difficult opponents on a big occasion. 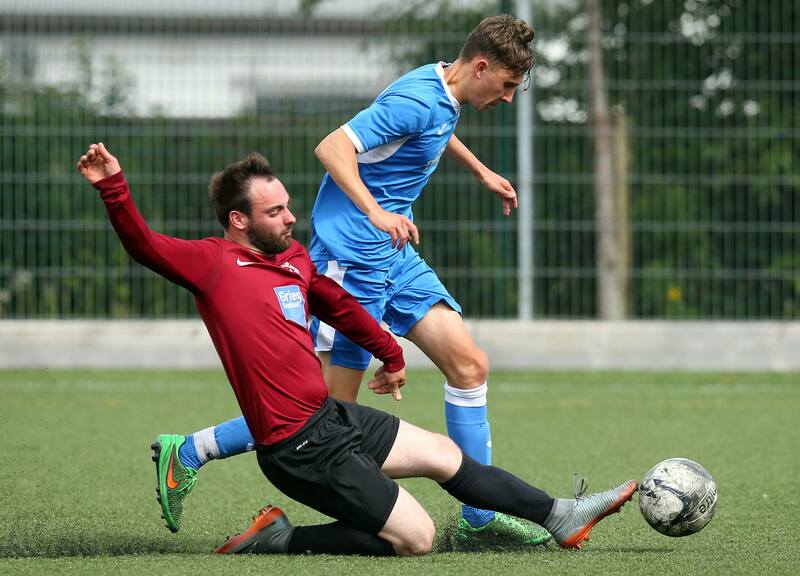 With goals and assists, David Falconer (red) has been in impressive form for Kyleakin. 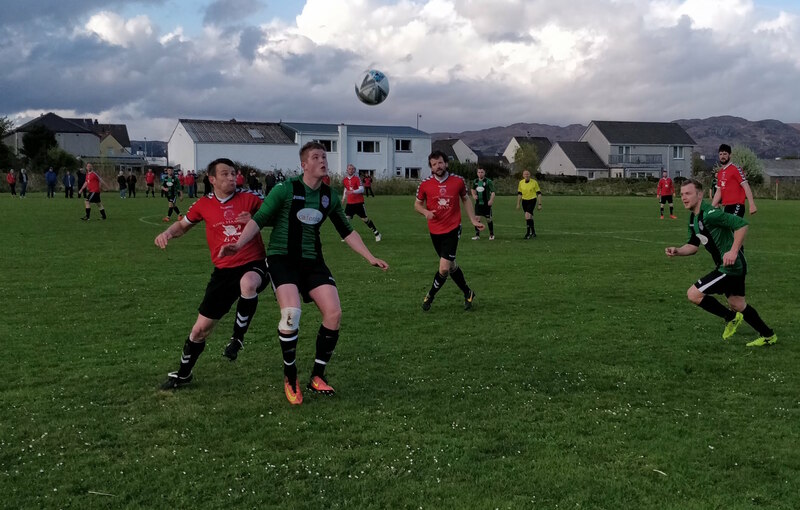 Although Kyleakin have put themselves in a good position to challenge on all fronts, they will have to address their inconsistency this season which has seen them held to draws recently by Glenelg and GA United. With back-to-back matches coming up against Sleat and Strath in the cup, then the league, the reigning champions will look to draw on their past successes in the big games.